NOTE: We recommend the Drag & Drop Builder over the Standard (Legacy) Builder, as it offers far more customization and our newest features. Get started with the Drag & Drop Builder here. Navigate to the Lead Pages tab on your account dashboard, then "View All Templates." Select a type of template from the drop-down on the right, search for a template, or simply browse through our collection. Hover over any template’s thumbnail, click Use Template or Preview. To learn more about choosing a template, check out our article: The Different Types of Leadpages Templates. Make sure you've connected your integrations before setting up your form. Learn how to connect integrations here. Once you've connected your integrations, you can navigate to your integration settings within your page by following the steps below. Click on your call to action button. Keep in mind that many templates include several calls to action. Your integration settings should appear right away if integrating the page for the first time, if not, select Integration settings from the left-hand panel. Select your integrations and where you'd like to send your leads, then click Customize this form. Make sure to click the blue Okay button at the bottom left corner as well as Save and Publish your page at the top right corner. Name your page and click Done. WARNING: Making sure to click Customize this form, the blue Okay button at the bottom left corner of the sidebar as well as the Save button at the top right corner of the builder is very import, as the Standard Builder does not auto-save changes. 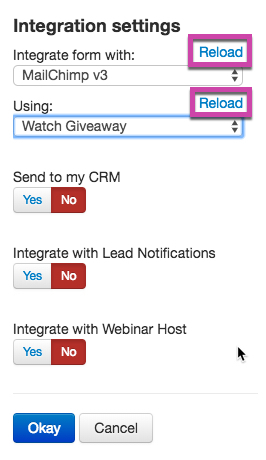 The "Send to my CRM," "Integrate with Lead Notifications," and "Integrate with Webinar Host" can also be turned on in these settings. NOTE: Whenever a change is made to a form or list within your email service provider, you'll want to make sure to Reload your lists in the Integration settings of your form. Some templates have a call to action button that defaults to a URL, rather than an integrated opt-in form (such as some sales templates). If that's the case, hover over any button on your page and click the ⚙ icon at the top right corner of the button, then Link options. Looking to add links, multiple forms and more to your Standard Lead Page? Take a look at our customization article here. Unlike the current builder, the Drag & Drop Builder, our Standard (Legacy) Builder does not have a 'Draft' mode. Therefore, when saving a Standard page, you also publishing your page. Click Publish in the top right corner of the builder to see your publishing options. Learn more about your options for publishing.